I spent four glorious days at our cottage in the Northwoods. The air, cool and bright, made for good walking, and the decrease in summer insects made everything downright comfortable. The tornado damage has been fixed, and our lakefront looks normal again. However, the lane leading in from the main road still looks as though the tornado hasn’t stopped moving. All leaves from the downed trees have browned, withered, and shrunk up to create more holes in the landscape than when they first fell. Men have come and chopped up some of the larger tree trunks, and carried away their choices for this winter’s firewood. We are glad of that, but they left much debris and small branches littered about. I spent an afternoon picking up these pieces, throwing them in the wheelbarrow and rolling them back to our fire pit. They make excellent firewood. 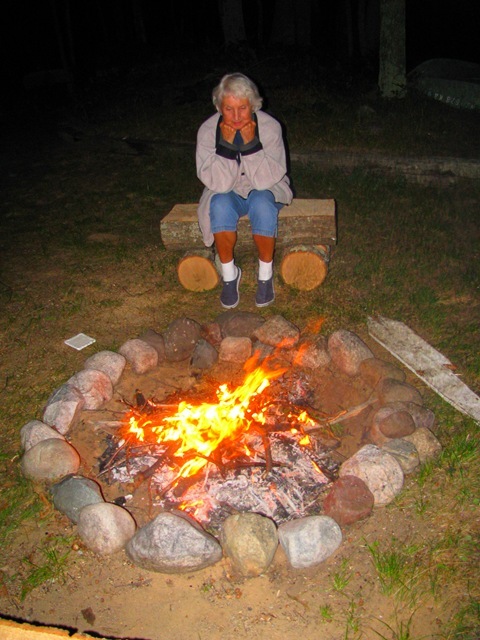 Mom and I built a wonderful fire one evening. Leaves are starting to turn red. Two weeks from now, the entire Northwoods will be glowing with fire-yellow oak leaves, red-ember maple leaves, and orange ground cover bushes. The colors will mix up and streak here and there, pop out at various levels, and give the impression of a carefully edited photograph. This entry was posted in Family, Life and tagged Autumn, Nature, Northwoods. Bookmark the permalink. 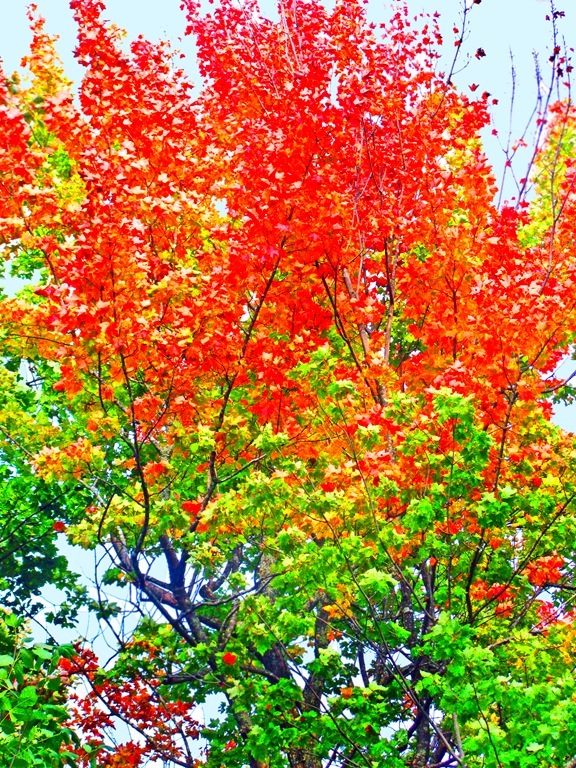 Three colors in a single tree! That’s so pretty! Omigosh, is it Autumn again already? My! Thanks for sharing this, I may no seethe in envy. Brilliant Marahm. I love Fall colors. I am glad you and your mom had a good time. That photograph is amazing Marahm – wow! That is such a beautiful pic. The colours are so vivid! Lovely!! Glad you are back! What a gorgeous photo of the leaves on the trees. Wow!! !